Handling errors while sending HTTP requests towards our server is always a must. This is exactly what we are going to do in this blog post. If the server returns an error with the 404 or 500 status codes, we are going to redirect a user to a specific page. Handling errors which have status codes other than 404 or 500 are going to be executed by using the modal form components. We already have the page for the Not Found (404) error, so let’s continue with the creation of the Internal Server Error (500) component. The Internal Server Error (500) component is ready and we may continue on. 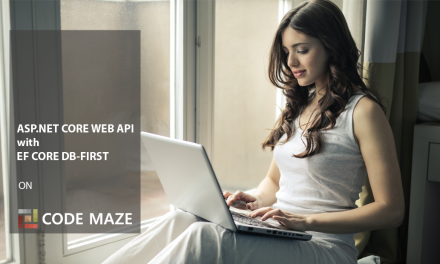 As we did with the repository part of this application, we are going to create another redux instance to handle errors in a single place in our app. We are familiar with the redux flow so this part is going to be quite easy to implement. One additional thing is that after creating a new reducer file, we are going to have two reducer files and therefore, we need to make different registration process inside the Index.js file. We can handle errors in a few different ways, and here we are going to do it by using multiple reducers in a project. Moreover, centralizing the error handling actions is a good practice overall. 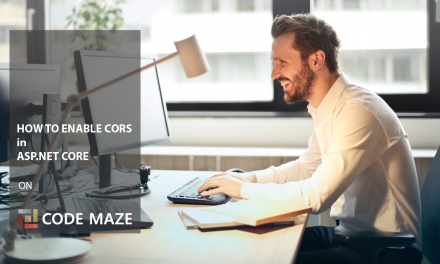 In the code above, we export the action handleHTTPError in which we check the error status code and execute the corresponding function. This is the same thing we did with the repositoryActions.js file. 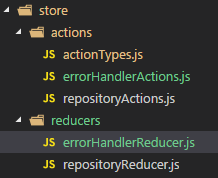 Let’s continue by creating a new reducer file errorHandlerReducer.js inside the reducers folder. This logic is familiar as well. We create the state (initialState) object and then the function reducer which accepts the state and the action parameters. The reducer function is going to update the state based on typeproperty sent from the errorHandlerActions file. That’s it. We import errorHandlerReducer file and the combineReducers function. Then with a help of the combineReducers function, we create the rootReducers object which contains all of our reducers. Finally, we just pass this object to the store creation. We must do this because we don’t have just one reducer file anymore. Both of our reducer files are registered inside one root object and therefore, we must specify which reducer we want to use. We can try our error handling by modifying the code in the server’s method GetAllOwners. As the first line of a code, we can add return NotFound() or return StatusCode(500, “Some message”), and we are going to be redirected to the right error page for sure. 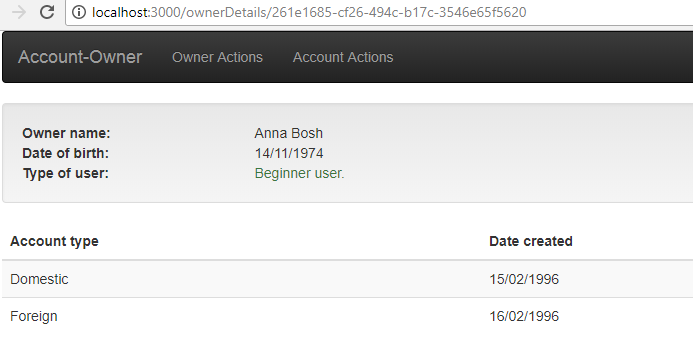 In this component, we are going to show individual owner with all of its accounts. If you are thinking: “Well, we could split this up into two components”, you are totally right. We are going to do exactly that. 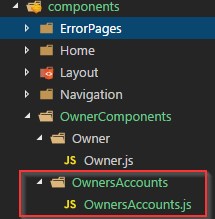 The parent component is going to be the OwnerDetails component and the child component is going to be the OwnersAccounts component. So, let’s start by creating a child component first. 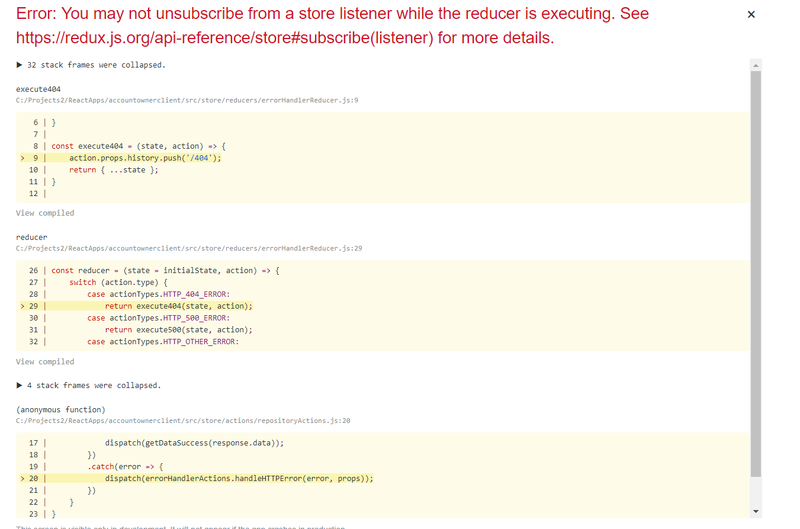 In the code above, we are using the this.props.data statement but we haven’t implemented a reducer yet. We are going to do that in a minute. Notice the renderTypeOfUserConditionally function call. In this function, we render the owner’s data conditionally and return the JSX code to display. We are going to implement that function in a minute as well. 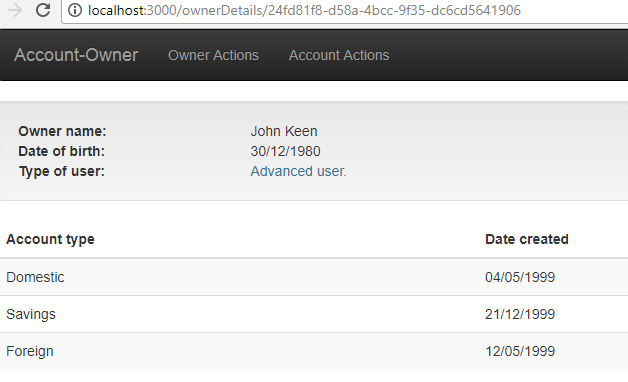 Bellow the owner’s data we are displaying all the accounts related to the owner. We fetch the id from the url by calling the match.params.id statement from the props object. 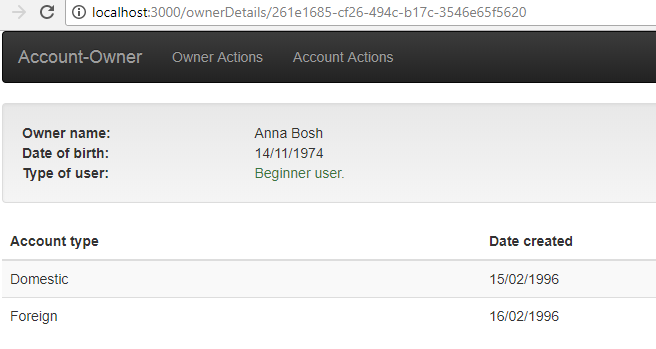 Then, we just create our url and call the onGetData property to fetch data from the server. We may inspect these results and be sure that all is working as expected. Right now, we are pretty sure that the Redux implementation is a piece of cake for you. As we’ve stated in the previous articles, after some practice, you’ll be able to implement the Redux flow easily by using its own implementation pattern. 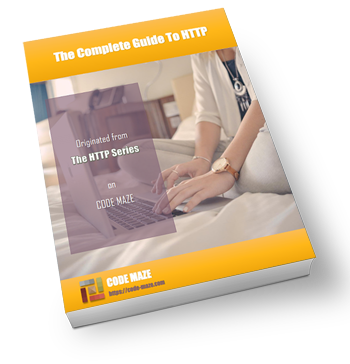 We have used it to send HTTP requests and to handle HTTP errors, and now it is up to you to practice its implementation on whatever task you want. In the next part of the series, we are going to learn how to use dynamic inputs to create forms. Moreover, we are going to introduce modal components and create a component for the POST actions. https://uploads.disquscdn.com/images/b5398c1dc8f6ff97a832c8a95ea12be9a284860c363c889027ab00d20f029c5f.png I get error when i insert “Not Found” in the GetAllOwners. Hello Alexander. I am sorry, but I’m not sure what do you mean by “insert Not Found in the GetAllOwners”? 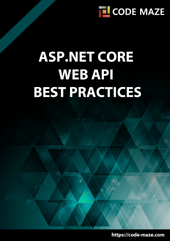 GetAllOwners is an action on the server side (.NET Core part) in the OwnerController file. So, if you have followed all the instructions of the series and changed that action by adding this code : return NotFound(); as a first code line , you should be getting 404 page on the client side for sure. Add please in the article , else button “Details” on the “Owner Actions” UI will not work. Thank you very much Alexander. It slipped somehow. Now it is fixed. It was in the source code, I just forgot to add it here. Hope you are enjoying this series. All the best.